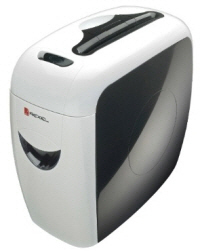 Ideal for personal use in the home or office, this ultra compact Style shredder provides sufficient security to shred confidential documents into little Cross cut pieces. It takes 7 sheets at a time and has an easy to empty 12 litre pull out bin holding up to 80 sheets on the cutters so you can purchase with confidence. Noise level is less than 73DBA. The Rexel Style+ cross cut paper shredder cuts paper down to 4 x 23mm confetti-sized pieces (security level P-4). This guarantees a good level of security for the home or executive use - in a stylish and compact package. With smooth lines and a pleasing colour scheme, the Rexel Style+ cross cut paper shredder looks great in any home or small office environment. The ultra-compact design means the Rexel Style+ is suitable for use as an under desk paper shredder, and even means that the shredder can be stored and retreived easily when not in constant use. Shredding up to 8 sheets (70gsm) or 7 sheets (80 gsm) in one pass, the Rexel Prostyle is perfect for the shredding needs of most home or small office users. The Rexel Prostyle will quickly shred every A4 sheet of paper into 400 cross-cut pieces to ensure that your physical confidential information is secure. This shredder features a convenient pullout bin with a capacity of 12L - enough to hold 80 sheets of shredded paper. With a useful view window to help customers quickly gauge how full the bin is, the Rexel Style+ demonstrates that there's sometimes no need for a larger shredder. With the ability to securely shred credit cards the Rexel Style+ can handle all aspects of your data security. The shredder is also able to take paperclips and staples in its stride, meaning that customers needn't lose any time in destroying their confidential information.